In “Classic Mode PvP,” you can bring 5 Mafia to battle (up to the maximum of 500*) for every level of your character. Each Mafia member can equip one Gun, Melee, Explosive, Armor, and Vehicle. Each item has attack, defense, bonus (if applicable) stats. The total attack and defense of your best items determines your stats going into battle. For any items beyond the maximum amount, only the best ones will be chosen. 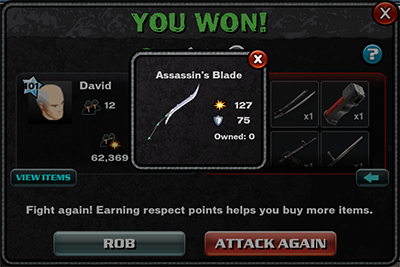 Additionally, Skill Points invested in attack and defense provide a behind-the-scenes bonus to the battle calculation. These benefits cannot be seen by either attacker or defender to add a bit of chance and mystery to PvP combat. Mafia ATK Total Attack points based on attack stats of the best items equipped by your Mafia, any applicable bonuses (mods), and Skill Points. Mafia DEF Total Defense points based on defense stats of the best items equipped by your Mafia, any applicable bonuses (mods), and Skill Points. In Classic Mode PvP, only the Mafia ATK and Mafia DEF stats are used. 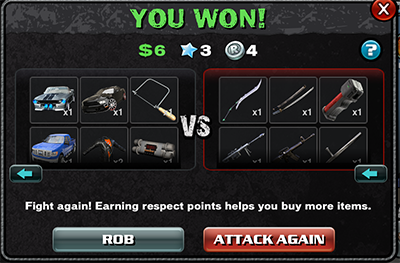 To defeat your enemies, get stronger by acquiring better equipment for your Mafia! *This limit can be increased through item bonuses. You can view the 50 best items that were used in the battle for yourself or your opponent by tapping on the VIEW ITEMS button on the corresponding profile view. 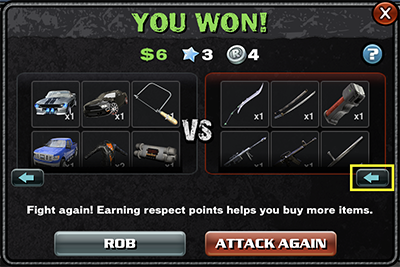 In the example below, the opponent’s items are shown. You can return back to the regular profile view by tapping on the ARROW button. You can inspect the stats of each item by tapping on the item. 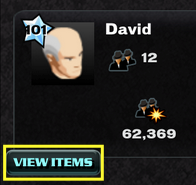 Tap on the X button to close the item stat window. 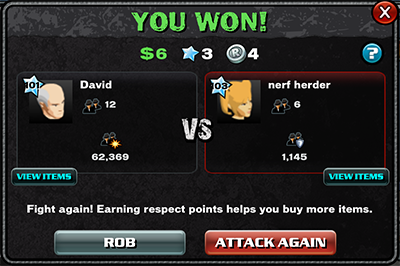 You can also compare items for yourself and your opponent simultaneously as shown below.